I apologize for another gardening post but frankly, between the garage and the garden... I have not had time to work on several other projects. But here are the first real batch of summer tomatoes. I served gorgeous BLT's to the guests we had over the fourth. No gourmet meal can compare to a home grown tomato sandwich with bacon, lettuce and mayo on a wonderful piece of toasted bread. See how tomatoes come in at different times even in the same bunch... God is amazing. 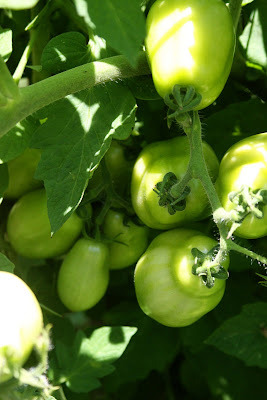 Several types of the tomatoes are "regular" tomatoes and we also have several types of Roma tomatoes. The Roma tomatoes are great for sauces. They are almost ready, a little longer. On a side note, for some "unknown" reason, I planted four cucumber plants. Now I have more cucumbers than one family can possibly eat... and no way to preserve them because they are not "pickle" tomatoes..... Seriously, 15 cucumbers yesterday and there are more growing. If you need some cucumbers, email me.... or stop by... or call me. Oh they look wonderful. This is pitiful but next week I'm baby sitting my friend's house. She says I can have the tomatoes. Woo hoo! LOL! I know what you mean about more produce than you can eat or give away. We often have that too. Oh your tomatoes look divine. We haven't really picked any yet. Oh my word -- there is NOTHING better than BLT's with garden tomatoes! YUMMY! 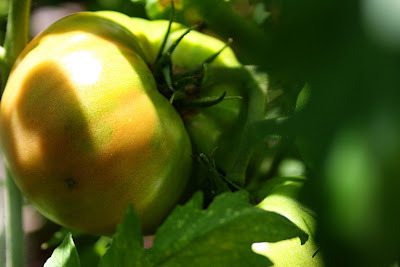 I want some garden tomatoes! 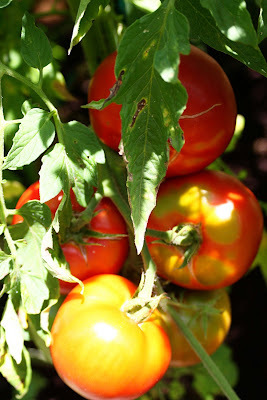 Next year, even if we're still renting, I'm so doing one raised beds with tomatoes! Oh yum! 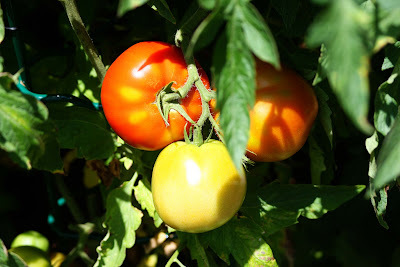 Your tomatoes look beautiful! Not to mention your cinnamon rolls from the other day! :o) I would love to try that recipe! Been there with the cucumbers!! Last year we had tons and I only planted 2 plants! 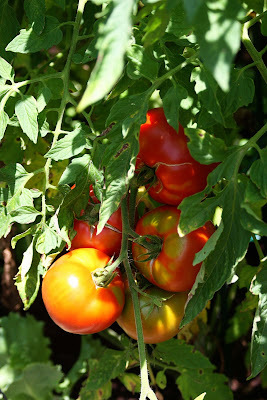 Your tomatoes look so good! I only hope ours come half as nice! We've had so much rain when we first planted them that I'm not sure anymore!!! Do you plant pumpkins?? If you do, I have a question!!! !